At its heart, building relevance is about living in the creative tension between evangelizing the things you care about and listening with interest to what others care about. It’s about radiating the inside out, and inviting the outside in. No one does this better than religious organizations. While art institutions and government agencies are squeamish about evangelism, religious institutions embrace both evangelism and empathy whole-heartedly. Their goal is to connect people to something beyond them that also happens to live deep inside them. They wave the key aloft, they sing its praises, and then they tell people: “The key is inside you. 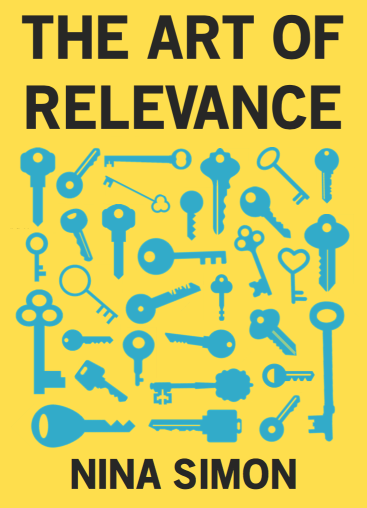 You will find your own key.” It’s the fundamental quest for relevance. That’s the quest Rabbi Noa Kushner is on. The rabbi has made it her mission to help people find new doors to Judaism. Noa runs The Kitchen, an un-orthodox, yet serious Jewish community in San Francisco. Jewish practice has been traditionally defined as accessible to some based on birth or conversion and not so relevant to others. It’s like God was having people count off, and the Jews were all number threes. The trouble is, many American Jews—especially Gen X and younger—find that number to be completely irrelevant to the way they lead their lives. Non-Jews who might find value in Judaism feel excluded, because they weren’t born into it or are not ready to convert. People think getting involved requires going all the way to conversion, which is an incredible amount of effort. It’s the perfect recipe for irrelevance. At the Kitchen, they don’t care if you are Jewish by birth. They care if you do Jewish—if you incorporate Jewish practices into your life. The Kitchen’s mission is to help people access the transformative power of Jewish religious practice. That’s not about blood. It’s about action. Rabbi Noa started The Kitchen by doing informal one-on-one research with disaffected and disinterested young, urban Jews. She spent time with “almost-comes”—people who identified with some of the principles that are central to Judaism, but who didn’t identify actively as Jewish. Judaism is steeped in social justice, community ritual, slowing down, personal connections—all things that mattered to the busy, young urban Jews Rabbi Noa was meeting. She learned what they valued and how they wanted to connect. She unraveled the conventions that made Judaism remote and unappealing. And then she started retying the knots, building The Kitchen to be relevant to them. Like many of the organizations profiled in this book, the Kitchen blends clarity of purpose with eager outreach to new communities. The Kitchen is unapologetically religious (“totally religious” in their words). They practice prayer. They celebrate Jewish holidays. They run a youth program and educational seminars and community events. They pray in Hebrew. They do Jewish. But they do Jewish in the most welcoming, inclusive ways possible. The Kitchen’s programs specifically reach out to non-practicing young and middle-aged adults in form, content, and style. They built a strong, visible brand: urban, a bit sassy, and focused on building community. And they are successful. Their services are packed. They reach Jews who haven’t seen the inside of a synagogue for decades. They reach spouses and friends who never felt welcome in a Jewish space before. About 40% of their members are not Jewish by birth. And those members are enthusiastically, whole-heartedly walking in the door to Judaism, singing its praise. Those of us working to make our work relevant are all motivated by the same evangelical impulse that drives Rabbi Noa. We believe in the power of what we offer. We believe in its potential to unlock meaning and value for people. We believe in that potential not just for the people who already know us, but for people on the outside as well. To be successful, we have to embrace evangelism. We have to be willing to expose our passion and try—however we can—to make it attractive and relevant to others. We have to be curious and humble as we learn more about the people on the outside. We have to be willing to build doors and renovate rooms despite our prior attachments. We have to accept failures and keep pushing and dreaming forward. When we are open to what our communities of interest seek and honest about changing our work to meet them, we can build relevance. We are missionaries. We are apostles. We do this work because it is big and important. It may not be hot. It may not be trending. But it can be relevant to the people we care about. It’s our job—our glorious opportunity—to make it so. Copyright © 2019 The Art of Relevance. Powered by WordPress and Drop Shipping.